Here we are in mid February, and I am finally beginning to see the early signs of spring in our region of North Carolina. The colder than normal weather we have experienced has pushed these early events a month later than in past years. I have now seen first daffodils and forsythia around town. 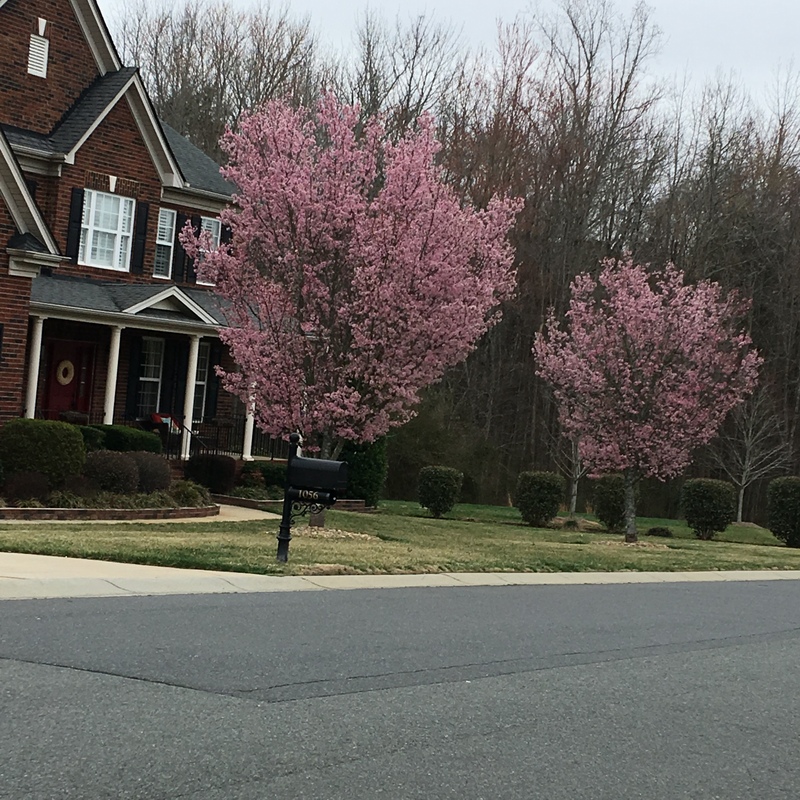 One of my neighbors has cherry trees in bloom, and similar ones are in color all over town. In my garden hellebores are finally blooming; Tete-a-tete daffodils are up and beginning to show a teasing of yellow; and a half dozen or more pots of tulips are poking up green shoots; my chives patch us up 4-6 inches. There is hope now for a colorful return of spring after all the dull, cold, wintry weather. I’m excited. I’m even going to venture out for a garden center visit…just to see what they have to entice me. This entry was posted in Gardening, Nature, Things I See Around Town and tagged forsythia, hellebores, Tete-a-Tete daffodil, tulips. Bookmark the permalink. Thanks, Christina. You’ve added a new phrase to my vocabulary. Glad to hear spring is on the move. If your forecast is anything like ours you’ll be sipping a cool drink in the shade in no time at all! Now you have put me in the mood! The neighbor’s cherries are Prunus x incamp ‘Okame,’ a hybrid of Prunus incisa and Prunus campanulata that is one of the best for the deep south (it flourishes as far south as mid Florida) since it has a low chilling point. I love it for its dainty blooms and upright vase-like form that reaches about 20-feet tall and, of course, for its early and extensive bloom period, which is prolonged by our typically cool but mild weather of late winter. Thanks, Marian. The changes are happening quickly now. I have several thick notebooks of garden trips to Normandy and England. I thought you might want to see them to assist in some of your travel initiatives. I can bring them to you when I visit my daughter. If you are interested, send me your email to johnnyvic7@yahoo.com and we can correspond offline to set it up.